Roland Nadeau, 70, will close the kitchen at Rolandeau's on May 12. 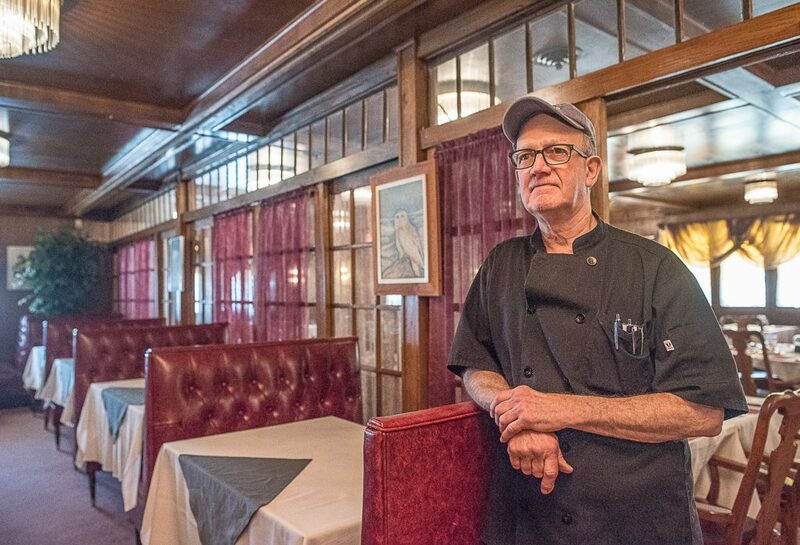 AUBURN — At age 23, with five years of restaurant experience under his belt, Roland Nadeau bought the closed Phil-O-Mar on Washington Street, remodeled and renamed the place, and started serving escargot, beef Wellington and, the dish he’d become known for, prime rib. Forty-seven years of working 14-hour days later, he’s coming out of the kitchen. Nadeau is closing Rolandeau’s on May 12. Rolandeau’s has been bought by a church that will likely change the rich interior — with its dark woods, gold crackle and high-end finishes that Nadeau employed to set the special-occasion tone — to suit their own needs. “I’m not attached to it, so whatever they do with it is fine,” he said last week. Nadeau wasn’t feeling sentimental. Yet. “Oh, I will, the day I close,” he said. As a teen, the Lewiston native worked at the Steer House, where the Carriage House is today on Lisbon Street. “I started there in 1965 the night of the Clay-Liston fight. That’s when they opened,” he said. He looked at two sites and landed on the Phil-O-Mar, which had been closed for a year and had been a Howard Johnson’s before that. The ornate dental molding still there dates back to Ho Jo’s. After taking three months to renovate, he opened Rolandeau’s on April 19, 1971. The restaurant name is a marriage of his first and last name. His father had suggested ending it with an “o,” Rolando’s, and he turned that down – too Italian. He opened with French-American cuisine, and as business picked up, he added on. Entirely self-taught, he made changes to the menu every few weeks, experimenting with a lot of Julia Childs recipes. Tablecloths have always covered the tables. Soft classical music has always played in the background. As he had hoped, Rolandeau’s became a place for birthdays, anniversaries and many an engagement, some memorable. “There was one girl, she almost drank her ring – he wanted to put it in her cocktail,” Nadeau said. He opened seven days a week to start, often working from 7:30 or 8 in the morning to 11 at night. After three years, he gave himself and the restaurant one day off a week. A decade or so ago, he extended that to two days. He said it’s never been in his nature to hire someone else to take over so he could take it easier. He said he’s also had an excellent staff through the years to pull everything off. Bartender Nick Talarico has been there nearly 42 years. Nadeau is glad, in a way, that the building won’t continue its life as a restaurant. When customers have been coming for 20 or more years, sometimes they stop telling you how much they enjoy the food, he said. That’s been nice to hear. He has several barns full of old furniture at his home in Turner that he’s looking forward to restoring and selling. He’s looking forward to leisurely mornings getting up and reading the paper over coffee. For 47 years, he’s been a back-of-the-house man who’s preferred staying in the kitchen over working the room, but he does plan to make an exception on the last day. “I’ll come out and say goodbye,” he said.